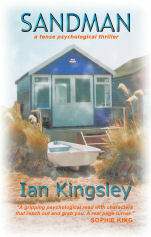 My novel Sandman is mainly set in and around Mudeford Sandbank, near Bouremouth, in the UK. 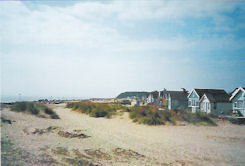 Other locations include Mudeford Quay, Stanpit, Tuckton, and Wick village. Take a walk in these locations after reading the novel and you may expect to meet some of the characters! Or me! Take this smartphone-friendly page with you on your phone! The main walk (from the Broadway car park — the shortest route). Allow at least half-a-day, or a leisurely day with a beach stopover. extended routes from Tuckton. Allow a full day for this. There are options for real walkers and a boat-trip option involving little walking and omitting the main walk. Something for everyone, in fact! 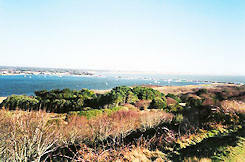 After that little visit, continue down the road with Christchurch Harbour to your left. On reaching the fork at the end of 'Barn Field', turn right, heading towards the sea, and then fork on the left-hand path to ascend the slope and steps of Hengistbury Head. 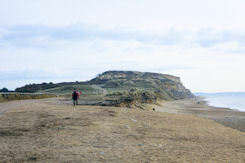 The picture shows the view towards what is correctly called 'Warren Hill' — although, to locals and visitors alike, it is normally just know as 'Hengistbury Head'. Hengistbury Head is really the eroded headland, but to avoid confusion, I shall also refer to the entire hill as Hengistbury Head. When you're near to it, Hengistbury Head does not look particularly imposing, although if you look across Poole Bay to it from afar it's a different matter. The picture shows that view inland, across the water meadows and Christchurch Harbour, towards the charming little town of Christchurch. Christchurch Priory can just be seen as the white tower near the centre of the picture. If you're there on a clear sunny day you may be able to glimpse the glint of its large golden fish wind vane on top of the tower. You get spectacular 360-degree views here! From the top of the hill you can appreciate how the Double Dikes were an effective protection for the flat land beneath you, site of an ancient Iron Age settlement — when Hengistbury Head and the dikes probably projected some 500 yards or so further out to sea. Sea-erosion is a big problem around here and it is hard to imagine that long ago this land was once a mile or so inland. The Head, together with Mudeford Sandbank, a long sand spit that extends from the Head itself, provide good protection for picturesque Christchurch Harbour — and protects the little town of Christchurch from flooding. Several burial mounds that date from the early part of the Bronze Age have been discovered on Hengistbury Head. These tumuli contain the cremated remains of individuals, and other items found include pottery and animal remains. 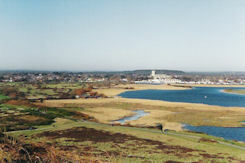 It is believed that part of Hengistbury head was essentially an early bronze age cemetery, perhaps for the local rich. The Iron Age settlement was in the area shown in the foreground. 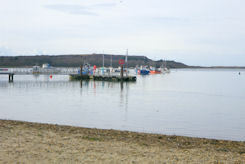 The harbour itself is fed from both the River Stour and the River Avon, which converge in Christchurch and flow together out to sea on a course that is actually parallel to Mudeford Quay, diverted by the sandbank. The narrow opening to the harbour is very tidal (and dangerous). On top of the Head is an unmanned coastguard station. If you take the main path across the Head, you will see the Isle of Wight facing you. 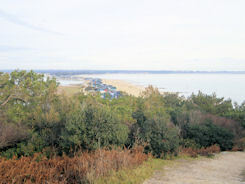 (If you take the little left-hand track just beyond the trig-point, you will pass near the spot where budding actress, Carol Davis, studied her script, and see her view over the green Holm Oaks in the nature reserve towards Christchurch Harbour and the distant Mudeford Sandbank: the sand barrier between harbour and sea. The left-hand track will lead you down to the lake Carol discovered (Quarry Lake), just before the drama of her attack. (If you cannot walk very far then continue left, downhill from the lake; this track takes you to the service road to Mudeford Sandbank and turning left takes you on a quick and easy route back to the Hiker café. This is the track down which Carol fled after her attack, meeting the little land train on the service road at the bottom.) Otherwise, I suggest you carry straight on and climb up the steps onto the top of the hill again, to walk to the end of the headland, where both these routes meet up for the wonderful view across Mudeford Sandbank itself. Even if you take the main route across the Head, you will still encounter the gravel scar that is the seaside end of the iron quarry that is now the lake. It has been dammed with ironstones to provide this wonderful wildlife habitat, turning a dreadful scar on the landscape into a place of beauty (at least at its northern end). In the 19th century this was the location of quarrying for ironstones (otherwise known as 'nodules' or 'doggers'). You can still see large ironstone nodules on the cliff-edge if you take the beach route around the end of the Head (when the tide is kind). The next picture shows the view from the end of the Head, looking down onto Mudeford Sandbank, but nothing but the real thing can really prepare you for its beauty: set off by the colours of the many beach huts (Stevie's favourite view). Mudeford Sandbank, by the way, is often just referred to as the 'spit' or 'sandbank'. After enjoying the view from this viewpoint, noting the Isle of Wight just across the waters of the Solent, descend the steps to Mudeford Sandbank itself. By the way, 'Mudeford' is pronounced "Muddyferd". 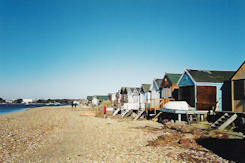 Mudeford Sandbank is somewhat notorious for having the most expensive beach huts in the world. It seems the craziness of this is forever being topped. So I can only put a number to it with a date. In March 2018 the record price was £295,000: amazing when you consider their relatively small size, and their lack of running water, electricity or a toilet. You can, however, sleep in them, and most have an upper sleeping level. Owners need to use wind turbines and solar cells to generate their own electricity. Why are prices so crazy? The only explanation I can offer is the extraordinary 'desert island' atmosphere which pervades the sandbank, and its relative isolation. And the fact that, despite prices, demand exceeds supply! Many of the huts are available for rental, by the way, so the 'island' experience can be bought at less rarefied prices. If you want to find the Black House and the end of the sandbank, just walk on as far as you can. 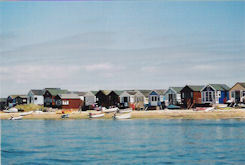 From there you will see Mudeford Quay, just across the waters of The Run. These waters here can be very dangerous, and may flow in either direction, according to the tide. Or you could take a ferry from the landing stage near the café across to Mudeford Quay where you can visit a pub (dog-friendly, yay! 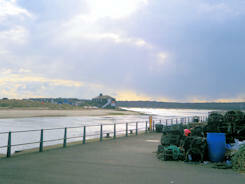 ), find another café (that's not), buy sea-food from a kiosk, or visit the lifeboat station. The next picture shows the view looking back from this quay towards the Black House (the place where Paul meditated in his great moment of turmoil, and the waters on which a major drama takes place). Time to return, and this time why not take the easier, flat route via the service road (down which Sasha took her night-time exercise). The next picture shows the harbour facing beach huts (one of which was that used by Paul and his family — although I had no specific hut in mind, so no good looking out for it). 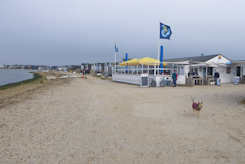 The next picture shows the beach walk which runs alongside them (looking towards the end of the sandbank and the location of the café). Now you have two options: a 20-minute walk (with good legs) or take the little land train (sometimes used in the novel). 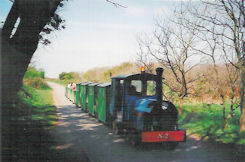 The land train is depicted in the next picture. It does not stop anywhere between the sandbank terminus and the Hiker café, so make your decision here! (Look for a notice about its timetable.) This train is a bit of a bone-shaker! On the way you pass through the trees (scene of more high drama in the novel), pass the nature reserve, and then finally end up right by the Hiker café, adjacent to the car park. If you would like a considerably longer route and are making a day of it, park in Wick Lane just off Tuckton Roundabout (or in the car park a little way along this road, to the left). Or if you arrive by bus, get off at Tuckton Roundabout. There are numerous options for you to think about - too many to detail! Nearby Tuckton Tea Gardens (towards the river and left from the car park) offer refreshment and boat trips, and the latter includes a ferry linking Wick Ferry, Christchurch Quay (both on the opposite side of the river) and Mudeford Sandbank itself. The much shorter Wick Ferry links Wick (on the same side you start) and Christchurch (adjacent to the Captain's Club Hotel). This gives you lots of options including boat trips and visiting Christchurch itself. Here are some ideas. If you are not a walker at all, take a return ferry journey to Mudeford Sandbank from Tuckton and enjoy a beautiful trip along the river and across Christchurch Harbour (scene of much activity in the novel). Another option is walking to the Hiker Café from Tuckton, via Wick village, along the riverside walk (Leah was stalked on the riverside walk and the Vincents built their new house in Wick.) Follow the riverside walk shown in the picture until you are opposite the open green area on the far bank, just past the Captain's Club. Turn right and walk to the road, then left along the road and through the village of Wick, with its picturesque green. Follow the road until it turns sharply right. Go ahead to the path by the tall wire fence and either turn left or right. 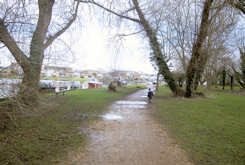 The left-hand route, behind some houses, leads to a field and you can branch right and walk towards Hengistbury Head on footpaths near to the river meadows; or turn right, following the high wire fence until you reach the school grounds, then left and straight on along the green area adjacent to the golf course. Both these walks end near to the end of the Broadway, and here you will find the Hiker café, start of the main walk described above. You can cheat on the main walk (if you are not up to a 20-30 minute further walk from here) by taking the (dog-friendly!) land train to Mudeford Sandbank, and even then take the river ferry back from the Sandbank to Tuckton Tea Gardens. These options are all very well, but you will miss-out on the spectacular views from the top of Hengistbury Head. Confused? Don't worry! Because this area is surrounded by water you can't really get lost! If the river is on your left, and the sea on your right, you are heading towards Mudeford Sandbank. The other way round and you're heading back to civilisation, the Hiker café, and Broadway!